Tomorrow is the opening ceremonies of the 2018 Winter Olympics. Here are some free notebook pages if you want to cover a few basic facts about Pyeongchang and the sports that are featured at the Winter Games! 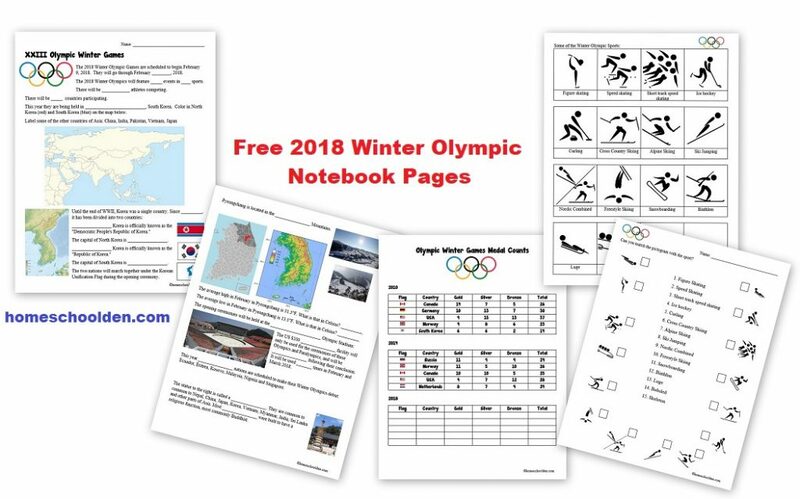 In this free packet you’ll find a page that covers some basic facts about the XXIII Olympic Winter Games, some geography of Asia and the Korean Peninsula. There is one page with the Winter Olympic Medal counts from 2010 and 2014. And there are a couple of pages about the 15 winter sports. Olympic Schedule of Events: Here is the link to the Olympic schedule over the next couple of weeks. Curling: My kids wanted to know more about curling, so we watched this youtube video showing some of the top-10 curling shots.